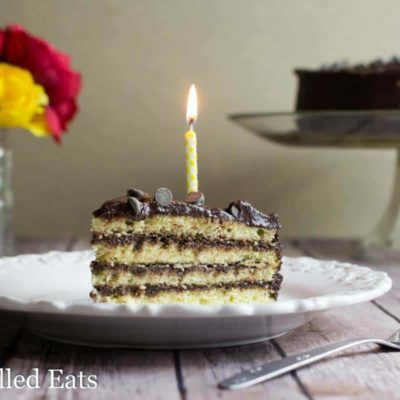 This Classic Yellow Keto Birthday Cake with Chocolate Icing looks just like my mom used to make, thanks to Pillsbury or Betty Crocker. My version is much healthier. It is sugar-free, gluten-free, grain-free, low carb, keto, and a THM S.
Happy birthday to me! I’m 35 today. I’m sure I will eventually regret disclosing how old I am publicly but I’m not there yet. Also, happy 8th birthday to my oldest daughter! That’s right, I share a birthday with one of my babies. When I found out I was due with my second child near my birthday I really hoped I wouldn’t have her on the same day. I wanted her to have her own day. It turned out that it didn’t really matter because it has basically become her day anyway. If my husband and I go out to celebrate my birthday we always celebrate before or after because I don’t think it would be fair to leave her with a babysitter on her birthday. I’m looking forward to celebrating with her someday with a girls’ lunch out and shopping at the mall but we aren’t quite there yet. My birth with my birthday baby was long. My water broke on a Friday night and she wasn’t born until Sunday afternoon. After having her I was starving but by the time we transferred to the postpartum room the cafeteria was mostly closed. I remembered that there was a piece of hospital chocolate cake on my lunch tray that I didn’t eat because, ya know, I was too busy having a baby. I asked my husband for my cake. He looked at me wide-eyed and admitted he threw it out when he brought my stuff to the new room. I had just given birth, after many, many hours, on my birthday, and he threw out my pathetic piece of hospital birthday cake. It’s funny now but I may have cried then. I decided to use Nancy’s Organic Whole Milk Yogurt when making my birthday cake this year. My husband is a good cook but doesn’t bake much so I tend to just make my own desserts. Including my birthday cake. Nancy’s yogurt is excellent in smoothies, parfaits, savory dishes, and baked goods. I love baking with yogurt because it increases the moistness of the cake and balances out the sweetness. Nancy’s Yogurt is made with fresh organic whole milk from local family farms. It is creamy, rich and free of cane sugars and thickeners. I really like when I can understand the ingredients on nutrition labels. This is one with only simple ingredients and no ‘bad for you’ additives. Nancy’s was the first company to add live cultures to their yogurt 50 years ago. There is something special about layer cakes. And the more layers the better. A three-layer cake just seems fancier than a two-layer cake. And a four-layer cake beats them all. Since I have four round cake pans I decided to go fancy and make myself and my daughter a four-layer keto birthday cake. If you prefer you can make this a two or three layer cake, just adjust the baking time accordingly. 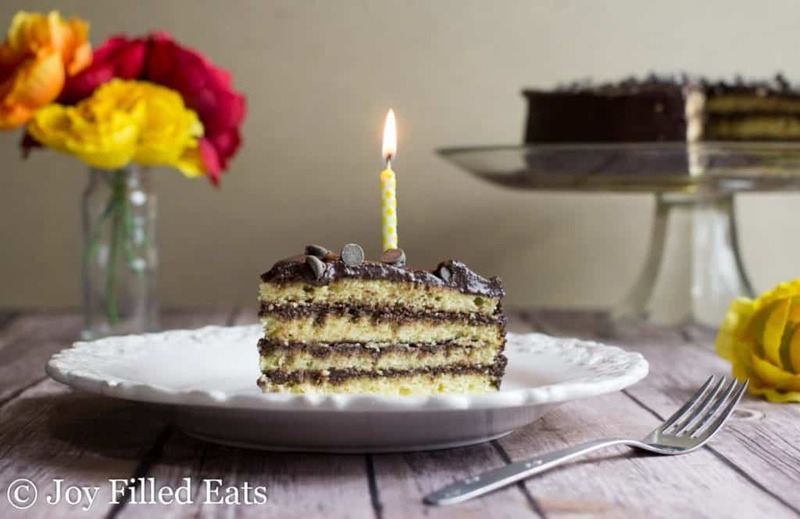 I hope you love this Classic Yellow Keto Birthday Cake with Chocolate Icing! If it’s your birthday Happy Birthday from me! This is the best birthday dessert ever. 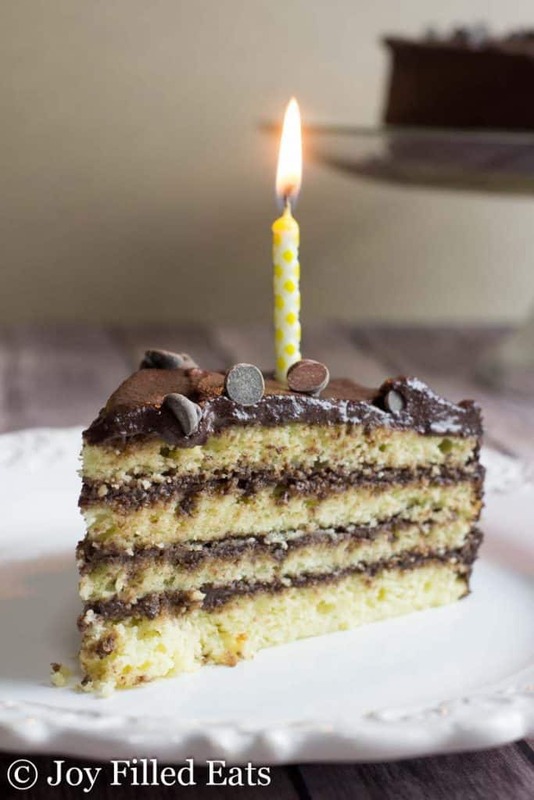 My Classic Yellow Birthday Cake with Chocolate Icing is so rich and decadent no one will know it's keto low carb or THM friendly! 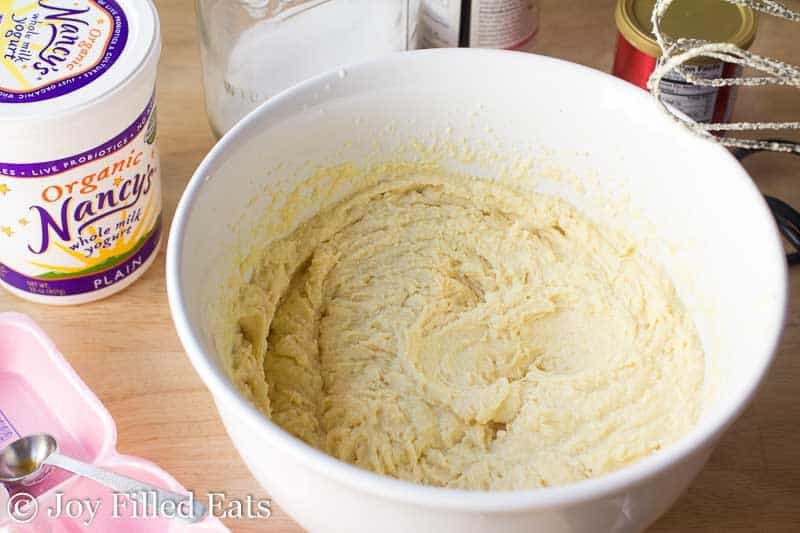 In a bowl with an electric mixer cream the butter and sweetener until light and fluffy. Add the yogurt and vanilla and beat until combined. Add the eggs one at a time mixing after each. Stir in the flours, baking powder, and salt until thoroughly combined. Divide batter between 4 round cake pans lined with parchment paper and cooking spray. Bake at 350 for 20-22 minutes until the cake springs back when lightly pressed with your finger and the edges are golden. Cool completely. Icing Instructions: Beat the butter and sweetener until smooth. Add the cocoa powder and half and half. Beat until smooth. Add the yogurt. Use to ice the cooled cake. In the frosting, could you use heavy cream in place of the half and half? Can I substitute Swerve for the frosting? Granular or powdered? Thanks! Is the batter supposed to have a ricotta cheese consistency? I agree....the more layers the better! 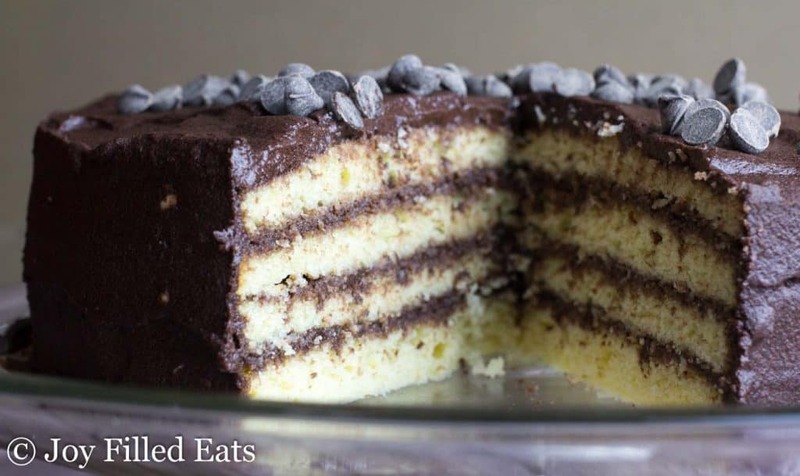 This cake looks phenomenal - I can't wait to try it! For real no one knew it was keto! It is that good! I am loving all of those layers! Anyone would love to have a cake like this for their birthday! Yellow cake with chocolate frosting is my husband's favorite but he is on the keto diet, so for his birthday, I was really hoping this cake would be a good stand-in. Perhaps I was expecting too much or my hopes were too high but the cake didn't really taste much like yellow cake. Also, it's probably because I pulverized erythritol in my ninja blender for the frosting, and it was grainy, but I'm sure if I had used the ingredients that were called for in the icing, it would have been better. Adjusting your taste buds to keto baking always takes some getting used to. There is no way to put this side by side with a traditional sugar and flour cake and expect to compare them. It's apples vs oranges. But yes, the frosting would've been better if you used the ingredients listed. Can I use a 9x12 pan instead? Yes, that should work. I'm not positive on the baking time though. I would bake it at 350 and check every five minutes once you hit the 20 minute mark. Thanks, Taryn. Baked about 30 minutes. Very good! Do you think this would bake ok cooked in 2 cake pans or do you think it needs to be spread out into 4 to bake properly? I only have 2 cakes pans :( Also, if I use Super Sweet, do you think I should grind it to a powder first? 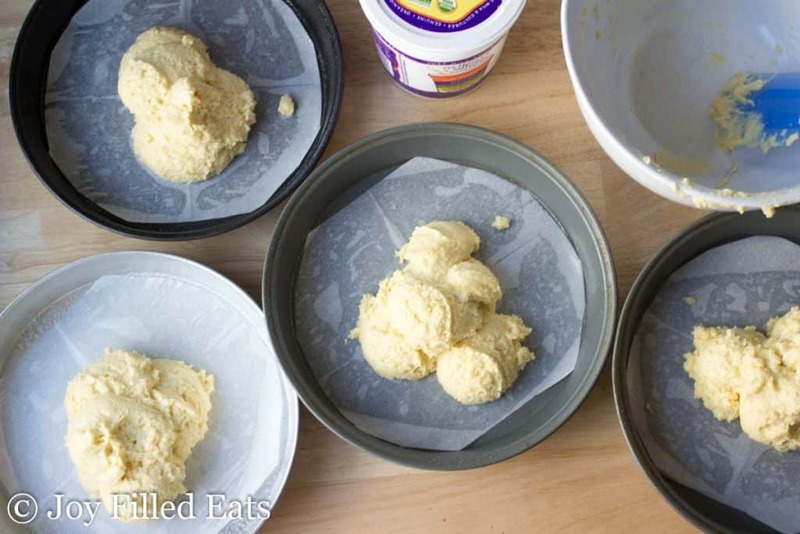 Yes, you can bake it in two pans but you will need to increase the baking time. I'm not sure super sweet will work in this icing. The icing may need the bulk of the gentle sweet. If you sub super sweet you only use half the amount. How much is a "stick" of butter? My butter comes in rolls. Hi, I tried to sift through previous comments to ensure you haven't answered this yet and didn't see any similar conversation so here goes. Wondering if you've (or anyone else has) tried a different sweetener besides "Gentle Sweet," i.e. honey, maple syrup, coconut sugar? Thanks! Can I divide the batter in half rather than in fourths since I only have 2 cake pans? Yes, but you will need to increase the cooking time. By 5 to 10 minutes is my guess. This cake looks fabulous!! What size pan do you recommend? A standard 9 inch round cake pan. 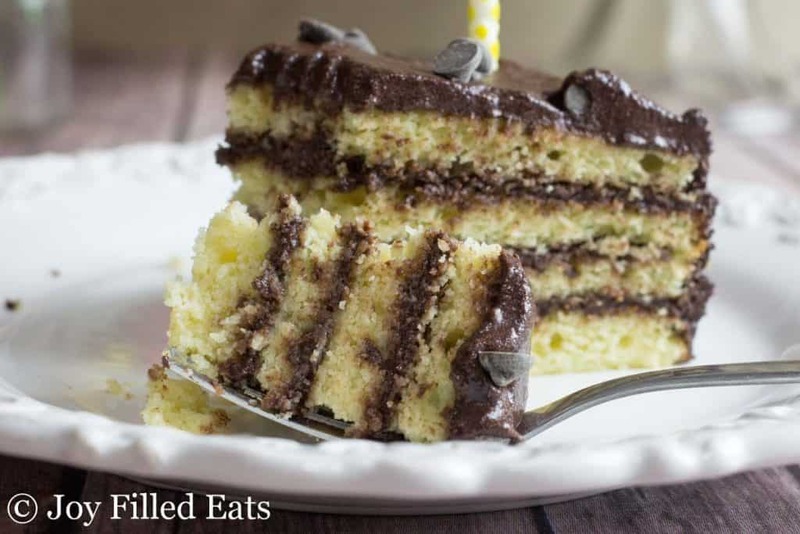 My husband has a birthday in May and I am practicing keto birthday cakes and was failing miserably until I found your blog. I honestly was just going to make a regular high sugar/high carb cake because nothing tasted right. Your recipe was my practice cake number 7 and it gave me new hope and I just wanted to thank you. I did add an extra egg yoke, but otherwise I followed your directions exactly. 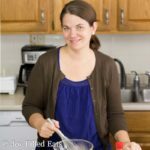 Keto baking is tough, but finding resources like your blog makes it SO much simpler! It looks luscious. Did it taste as good as it looks? Scale of 1-10? Thank you for the recipe. Saving for my June birthday! I hate to ask, but my husband is allergic to almonds so I can't use almond flour. Can you tell me if you think a baking blend would work? Thanks and I can't wait to try it. I never mind questions but I don't always have an answer ;) I think you can sub in a baking mix but I've only tried it with almond flour. This looks really good, I look forward to trying it! When I saw your email in my inbox, I immediately said "I like cake!" My hubby and I were getting ready to watch a movie, but I was like, "hold on, I gotta look at this cake!" Thanks for posting, and for all your recipes. Happy birthday! A belated happy birthday, Taryn. Your cake looks amazing. I really hope you had a fantastic day! Aww. Happy Birthday, friend. How nice that you have a mutual birthday with your daughter. I had a mutual birthday with my Dad's dad. It was always a day that made me think about him. I am sure you and your daughter will cherish this as a very special day as she gets older. This cake looks very good. I'm a sucker for a great yellow cake with chocolate frosting. Wow, this is a big, beautiful, wicked good looking cake! I'll have to try this on my Birthday! 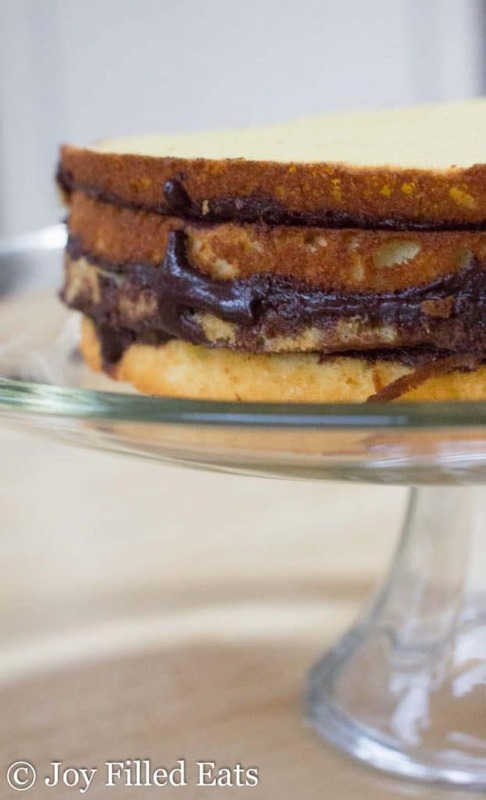 Can't go wrong with the classic yellow cake and chocolate frosting, the more layers the better! Happy birthday to you and your daughter! I have Greek yogurt in the fridge right now, do you think I could substitute that for the whole milk yogurt?? That would save me a trip to the store. It's become bi-weekly the last month with the holidays and just busyness of my own life :) The last one was January 6th. Did you receive that one? I'll have a new one going out this weekend. No I didn't receive one since the middle of December . Thanks. Happy Birthday! This looks great and I bet it tasted amazing! Happy Birthday to both of you?This looks perfect! Can't wait to try. Last time I made a layer cake, I tripled the recipe I was using...Lol. We had chocolate cake in the freezer for weeks! 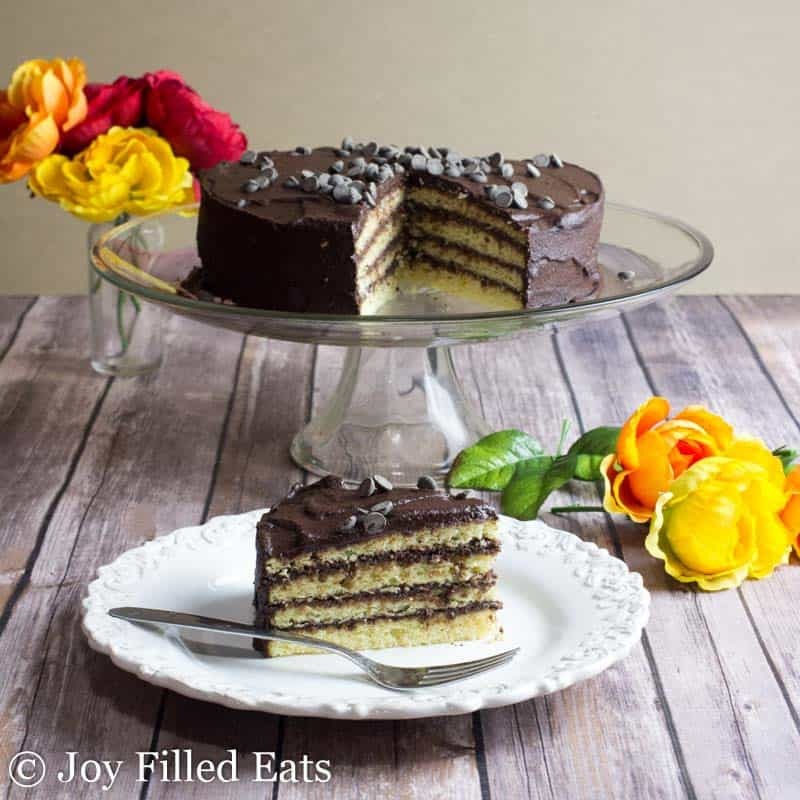 Love the yellow cake/chocolate combo; always reminds me of Little Debbie's ? 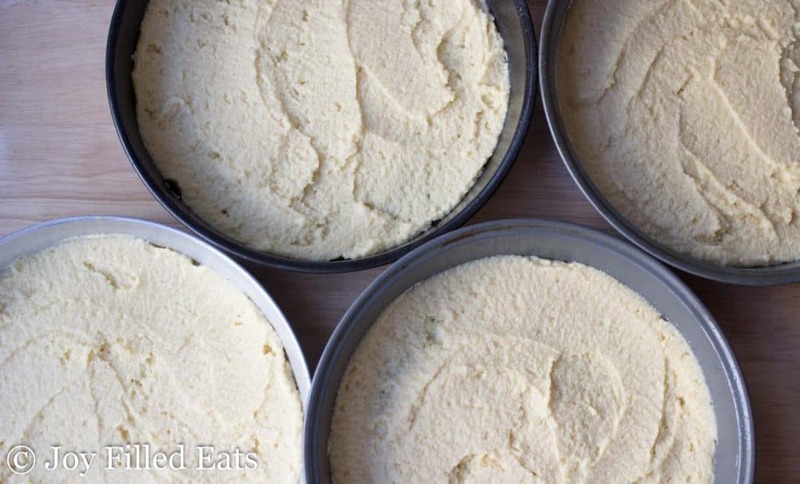 What size baking pans are you using? Would the batter get done if only using three? Standard nine inch pans. Yes, you can just make three layers but you will need to increase the baking time. My guess would be by about five min. This looks fabulous!! I'm getting ready to make my own birthday cake tomorrow! I don't have any almond flour on hand. 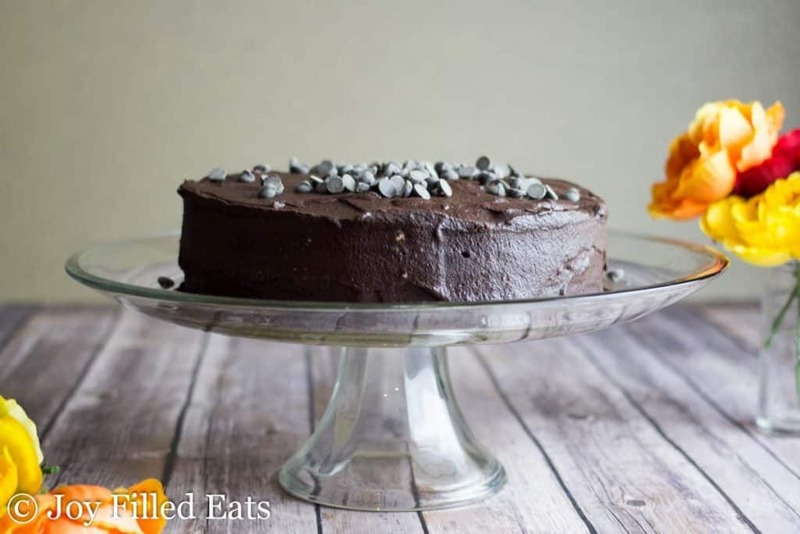 Have you had any success with using THM baking blend in this recipe?! Would you sub 2-1/2c? More? Less? Blessings! Hi Siobhn, I have not tried baking blend in this recipe. I try to eat grain free most of the time. I do know it is a little drier than almond flour. I would sub 2 cups and see how the batter feels. It was a typical slightly thick cake batter. Wonderful, thanks so much, and happy birthday!! !